It’s the unthinkable — a terrorist attack, a powerful tornado, a massive explosion, contamination of drinking water, the crash of an airliner that kills both passengers and people on the ground. All of these things can paralyze communities, making it difficult for them to respond quickly. Wright State University has helped build a unique team of experts and community leaders to think about the unthinkable and plan for it. The newly formed, 43-member Dayton Think Tank is brimming with terrorism, disaster and toxicology experts, emergency management specialists, military officials, political leaders, medical professionals, engineers, psychologists, computer scientists and law enforcement officials. Among the members of the group is Dayton Mayor Nan Whaley. “The Dayton Think Tank provides a great opportunity for academics and first responders to work together and share opportunities for our residents,” Whaley said. Oroszi is an assistant professor of pharmacology and toxicology at Wright State and director of the department’s Chemical, Biological, Radiological and Nuclear (CBRN) Defense certification program. She came up with the idea for the think tank following a visit to Wright State by the assistant commandant of the Army’s Chemical, Biological, Radiological and Nuclear School at Fort Leonard Wood, Missouri. The think tank, which meets quarterly at the Engineers Club of Dayton, first met in July. At the second meeting, in November, members were placed into subgroups based on their expertise. The think tank could be used to form a command center in case of emergency. It plans to conduct tabletop exercises to practice emergency response and work on creating resilience in the community to minimize the impact of a disaster. A website will include strategies for preparing and responding to emergencies, and the think tank will have a social media presence. The think tank will also sponsor an annual symposium on disaster-related issues. Gruenberg has worked as a firefighter in the New York City and Kettering fire departments. He was a key leader in the development of urban search and rescue team Ohio Task Force One and has deployed 14 times to disasters that included collapse of the World Trade Center as well as hurricanes Katrina, Ivan and Rita. Larry James, director of the Continuing Education Program in Wright State’s School of Professional Psychology, was chairman of the psychology department at Walter Reed Army Medical Center in Bethesda, Maryland, when a Boeing 757 hijacked by terrorists slammed into the side of Pentagon on Sept. 11, 2001, collapsing a portion of the building and killing 125 occupants. James led teams of mental health professionals into the burning Pentagon. And from Sept. 11 through December, the teams provided psychological services near the Pentagon to victims of the attack and their families. Oroszi echoed that. She says a major benefit of the think tank is that it enables experts and community leaders to share knowledge, resulting in a cross-pollination of expertise. “I think that is perhaps the most valuable thing about this,” she said. The think tank has four mayors, including Fairborn Mayor Dan Kirkpatrick. It also includes Dayton Police Chief Richard Biehl and Dayton Fire Chief Jeffrey Payne; representation from Wright-Patterson Air Force Base, local industry and the University of Dayton; and 17 people with Wright State connections, with representation from five colleges as well as the Wright State Research Institute and the Ohio Center of Excellence in Knowledge-Enabled Computing. 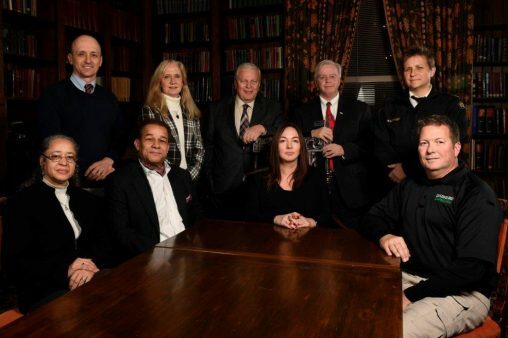 The representatives from Wright State include Oroszi, James and Gruenberg; Jesse Burgard, of the School of Professional Psychology; Sherry Farra, director of the National Disaster Health Consortium; Stephen Farrell, director of environmental health and safety; David Finnie, chief of police; Jennie Gallimore, associate dean for research and graduate studies; Jill Lindsey, director of the Office of Evaluation and Research; Marjorie Markopoulos, biological and chemical safety officer; Greg Merkle, environmental health and safety specialist; T.K. Prasad, professor of computer science and engineering; Vikram Sethi, professor of information systems and supply chain management; Valerie Shalin, human factors area leader; Richard Simman, professor of pharmacology and toxicology; Amit Sheth, executive director of the Ohio Center of Excellence in Knowledge-Enabled Computing; and LaPearl Winfrey, dean of the School of Professional Psychology.